William Partridge Burpee was born in Rockland, ME and lived in Boston, MA. He studied with marine painter William Bradford. He was a member of Boston Art Club. He exhibited at the Boston Art Club; Pennsylvania Academy of the Fine Arts; Corcoran Gallery; the American Watercolor Society; the L. D. M. Sweat Museum (now Portland Museum of Art), in Maine; the Boston Society of Watercolor Painters and the Copley Society, Boston; and the Art Institute of Chicago. At age 51, he toured Europe by bicycle, 1897-99. When in Holland, he discovered pastel. At the St. Louis Exposition, in 1904, he received a bronze medal in this medium. Many of his life’s paintings were burned in the Harcourt Studio Building fire of 1904 in Boston. 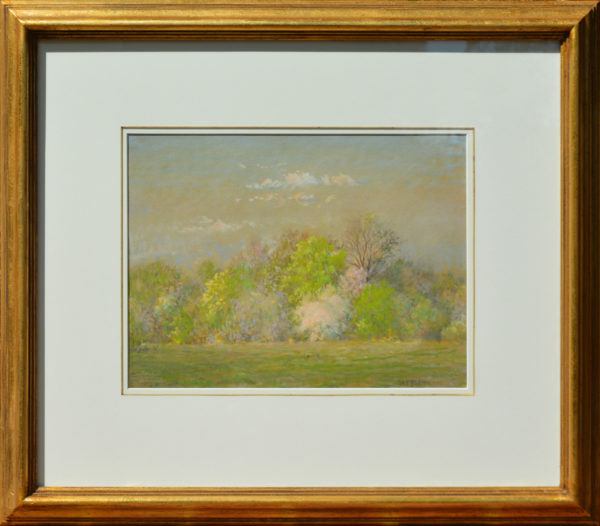 He was a prolific painter, and later produced approximately 800 works, many of which are of coastal scenes around Lynn, Nahant, Marblehead, and Salem, MA. “William Partridge Burpee: American Marine Impressionist” and, in 1994, “The Lynn Beach Painters: Art Along the North Shore 1880 – 1920”. Comments This painting is nicely framed and in excellent condition.